diet coke | Jog: a quick Jennifer blog! It sounds so bad, but I really can’t slam it until I try it. So calories and good sense be damned. I’m going to Taco Bell for breakfast. As I open the nifty cardboard container, I suddenly feel like I am on an episode of Man vs. Food. Can I really eat all of this? The folded waffle contains scrambled eggs and a sausage patty, topped with cheese and bacon. 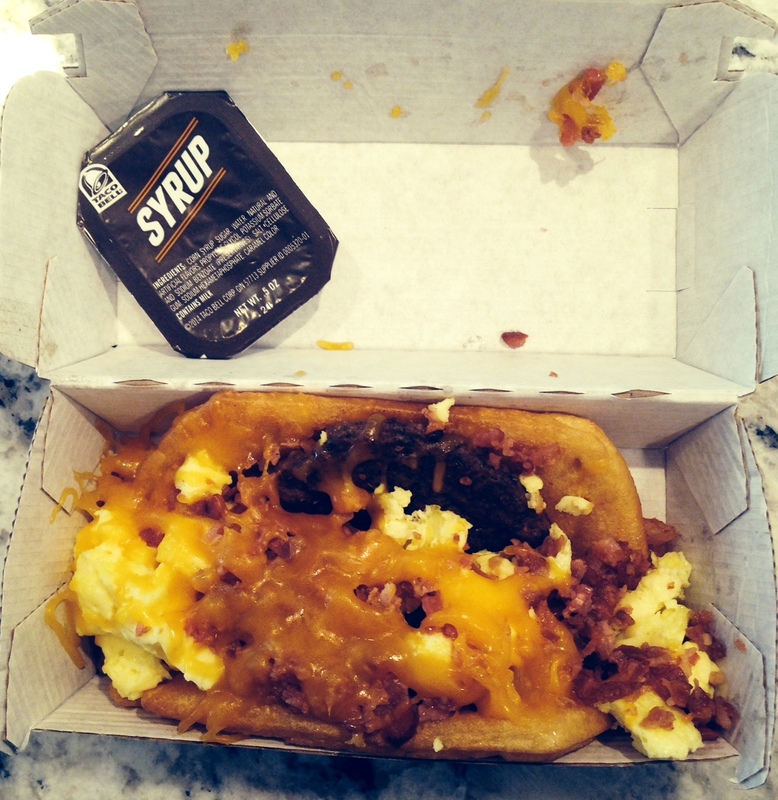 Taco Bell also provides a side of syrup. First bite: I opt for no syrup to get started. The waffle itself is surprisingly crisp. I thought it might have gotten soggy on the car ride to my house, but it actually has a pleasing texture. The mixture of eggs and sausage tastes good with the waffle. Second bite: Now I am getting to the part with the cheese and bacon topping. Not sure how all these flavors will meld, I take a tentative bite. It’s pretty good, as are most things topped with cheese and bacon. Third bite: Going for it, I dip the whole thing in syrup. It’s crunchy, savory, sweet, and fairly delicious! Bites five, six and seven: Continuing with the syrup, I enjoy this crazy waffle taco. Eighth bite: I am starting to feel a little sick and throw in the towel, leaving behind about a third of the taco. It’s just too much. I think without the bacon and cheese, I could go on, but what would be the point? The final question is: would I get a waffle taco again some morning? Even though it tasted pretty good, the answer is no. If I am going to lose my mind and eat something that fattening for breakfast, they better at least let me get a Diet Coke. But alas, Taco Bell only serves Pepsi.